Al-Haj Shamsuddin Mansion - 10th Floor, 17, (Old 280) New Eskaton Road, Moghbazar, Dhaka - 1000, Bangladesh. 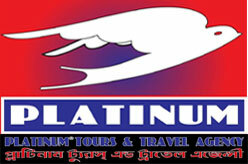 Founded in 1996, Abakash Parjatan Ltd is a domestic and international tour operator based in Dhaka, Bangladesh. 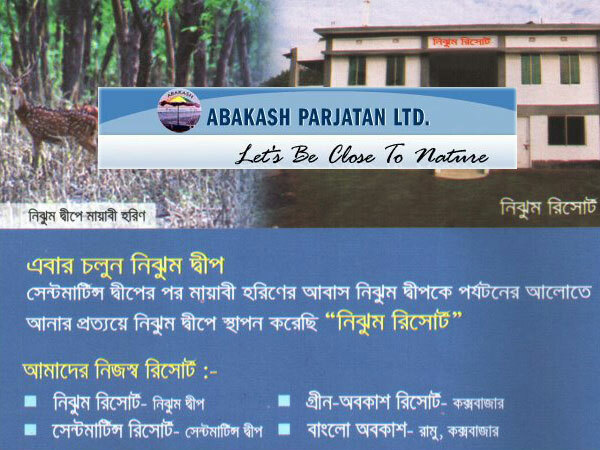 Other services of Abakash Parjatan Limited is event management and logistics services, hotel booking, air ticket, transport services, vessel ticket. 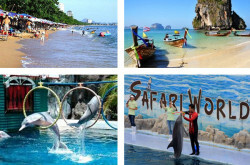 Also arranges sightseeing tour, conference, workshop, seminar, symposium, picnic etc. 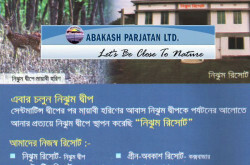 Projects and Services by Abakash Parjatan Ltd.
** Price may change any time. updated june 2014. VIP Room : Att. Bath / 3 Beds / 2 Rooms / 2500 BDT. Executive Room : Att. Bath / 3 Beds / 14 Rooms / 2200 BDT. Deluxe Room : Att. Bath / 3 Beds / 5 Rooms / 2000 BDT. Cottage : Att. Bath / 2 Beds / 6 Rooms / 1500 BDT. Dormitory : Att. Bath / 14 Beds / 1 Room / 3500 BDT. Dormitory : Att. Bath / 7 Beds / 1 Room / 2800 BDT. Dormitory : Att. Bath / 6 Beds / 3 Rooms / 2400 BDT. ** Extra person Tk. 200 each. Executive Room : Att. Bath / 2 Beds / 5 Rooms / 1500 BDT. Executive Room : Att. Bath / 3 Beds / 2 Rooms / 1800 BDT. Family Room : Att. Bath / 5 Beds / 1 Room / 2500 BDT. Dormitory : Att. Bath / 12 Beds / 1 Room / 3000 BDT. Dormitory : Att. Bath / 5 Beds / 2 Rooms / 1500 BDT. AC Room : Att. Bath / 2 Beds / 2 Rooms / 2500 BDT. Non AC Room : Att. Bath / 2 Beds / 1 Room / 1500 BDT. Non AC Room : Att. Bath / 2 Beds / 1 Room / 1000 BDT. Conference Room : Att. Bath / 30 person / 1 Room / 3000 BDT. Whole Complex : 10,500 BDT. *** Check out time 12 noon. *** Price may change any time. updated june 2014. 17, New Eskaton Road, Moghbazar, Dhaka-1000. 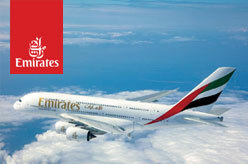 Mobile : +88 01866 989855, 56, 60, 66, 77.